Analog Phone / Fax Adapter | 8x8, Inc. The OBi300 supports 1 RJ-11 FXS analog phone port for use with your 8x8 service plan, either an analog voice plan, a fax plan, or an overhead paging plan. The OBi508vs supports 8 RJ-11 FXS analog phone ports for use with your 8x8 service plans. Any port can support a voice, fax, or paging plan. 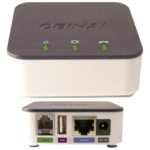 The Wi-Fi dongle plugs into your Obihai 300 ATA to add a wireless connection via your Wi-Fi network, where wired Ethernet access is not available or convenient. The MP-112 provides 2 RJ-11 FXS analog phone ports for use with your 8x8 service plans. Any port can support a voice, fax or paging plan. The MP-118 provides 8 RJ-11 FXS analog phone ports for use with your 8x8 service plans. Any port can support a voice, fax or paging plan. The MP-124 provides 24 RJ-11 FXS analog phone ports (when used with breakout accessory) for use with your 8x8 service plans. Any port can support a voice, fax or paging plan.